1. Up top, click “Save as template” to save the structure of your trip as a template. You could use this template next time to launch quickly a new search based on data of this trip. Click on the calendar icon to add your trip details to your agenda. 2. Under trip code, you can see your Rydoo Trip reference. Under trip name, you can give a name to your trip, so you’ll find it easily in your trips list. Scroll the screen to see all services of this trip. 3. When you have no more services to add to your trip, click on the “NEXT” button to finalise your booking. 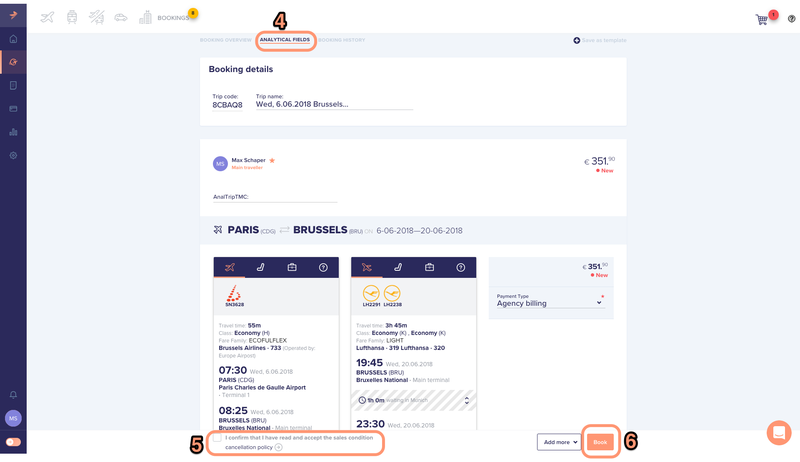 The section under the trip code is visible if your company has activated “analytical fields”. Each field is defined by your company. Regarding other fields (editable or non-filled in), you must complete at least fields identified as mandatory thanks to the star icon to be able to confirm or put on hold your trip. 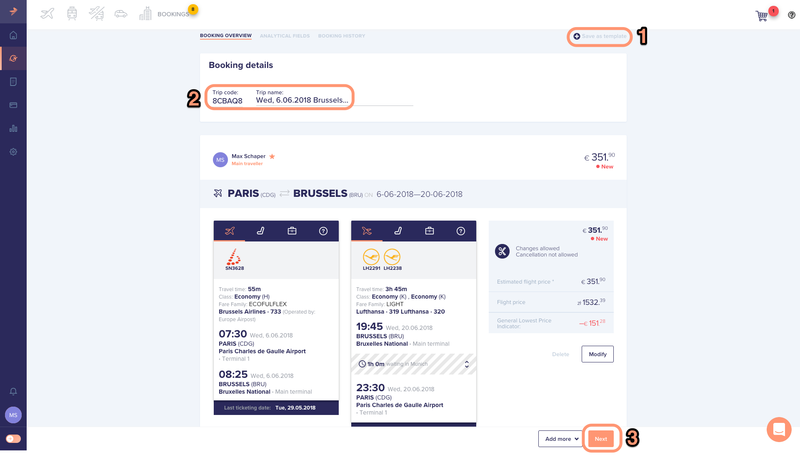 Underneath this section, you can select the approver who will validate your trip, if your company has defined an approval workflow and lets you choose your approver in a drop down menu. If you're paying by credit card you will be redirected to a third party payment portal to complete your booking. Here you can enter in the necessary payment details and check out. Once completed your trip will be confirmed.